This EA trades with Stochastic Signal Line and Base Line crossovers. 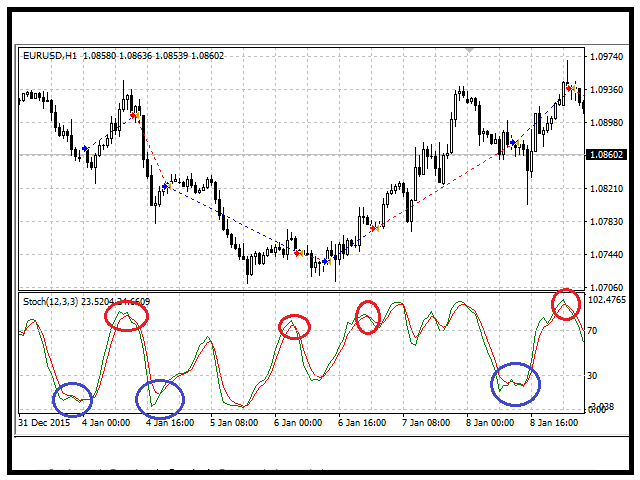 Stochastic will base its value on the current time frame. Only allows one open trade at a time. Two strategy to choose, crossover and trend following. Optimize risk management settings for lot size and martingale. Opens a buy position if the Signal Line crosses below Base Line and base line is below the Buy below crossover level. 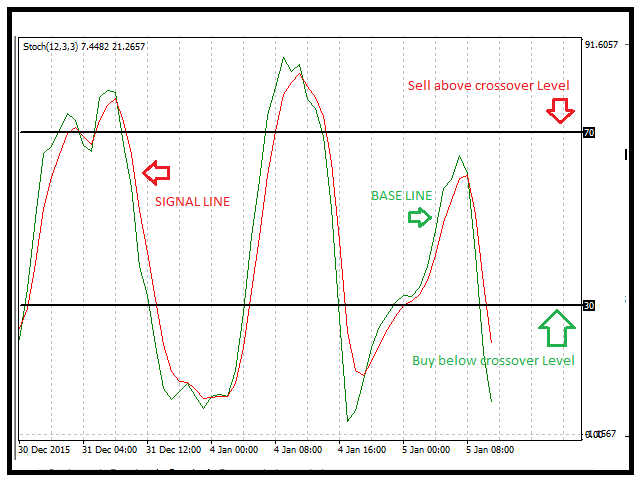 Opens a sell position if the Signal Line crosses above Base Line and base line is above the Sell above crossover level. if Close on Reverse Trend is set to true. Close a buy position if the Signal Line crosses above Base Line and base line is above the Sell above crossover level. Close a sell position if the Signal Line crosses below Base Line and base line is below the Buy below crossover level. Opens a buy position if the Signal Line is below Base Line. Opens a sell position if the Signal Line is above Base Line . Close a buy position if the Signal Line is above Base Line. Close a sell position if the Signal Line is below Base Line. if Reverse Logic is set to true, opening and closing of position will be reverse in order type. MagicNumber - return an identifying (magic) number of the currently selected order. Strategy - The option to choose Crossover or Trend Following. Reverse Logic - Reverse order type. 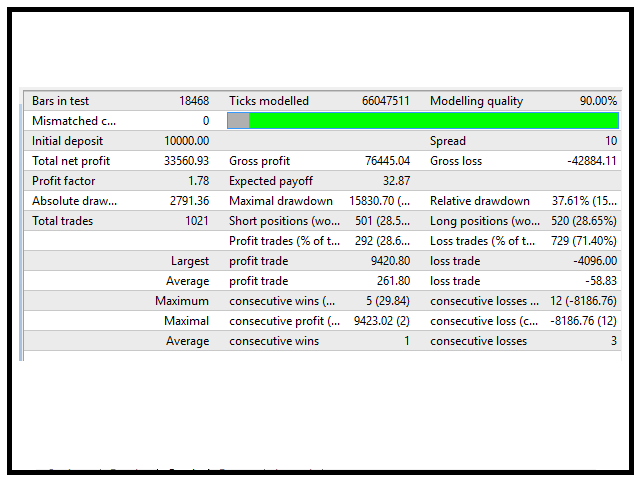 Max Spread Pips - distance between Ask and Bid, at which you allow the EA to open a trade. Max Slippage - The difference between the expected price of a trade, and the price the trade actually executes at which you allow the EA to execute an order. Indicator Bar Value - The option to choose current bar value or closed bar value. %K value - Input %K value. %D value - Input %D value. Slowing value - Input %Slowing value. Buy below crossover Level - Input Buy below crossover Level. Sell above crossover Level - Sell above crossover Level. Price Field - Low/High or Close/Close. MA Method - Moving Average method. It can be any of enumeration values. SMA, EMA, SMMA, LWMA. Start Lot - Starting lot size. Loss Factor - Multiplier of last lot size if the last trade was a loss. Max Consecutive loss - Maximum Consecutive loss, it will restart to starting lot size if reached. StopLoss - Stop loss value relative to open price. Measured in pips. TakeProfit - Take profit value relative to open price. Measured in pips. Trailing Stop - Modify Stop order when moves price moves to its favor, set 0 to deactivate. Close on Reverse Trend - if set to true, it will close open trade if it met the condition in reverse of opening the trade. ~~~~~Time and Day Filter Settings~~~~~ - For Opening of Trades Only. Daily Start Time - Starts to open a trade. Daily Stop Time - Ends to stop opening a trade. Monday - Trade on Monday. Tuesday - Trade on Tuesday. Wednesday - Trade on Wednesday. Thursday - Trade on Thursday. Friday - Trade on Friday. Martingale is a very risky strategy! Do not trade with money you can’t afford to lose! Consider withdrawal as a part of the strategy! 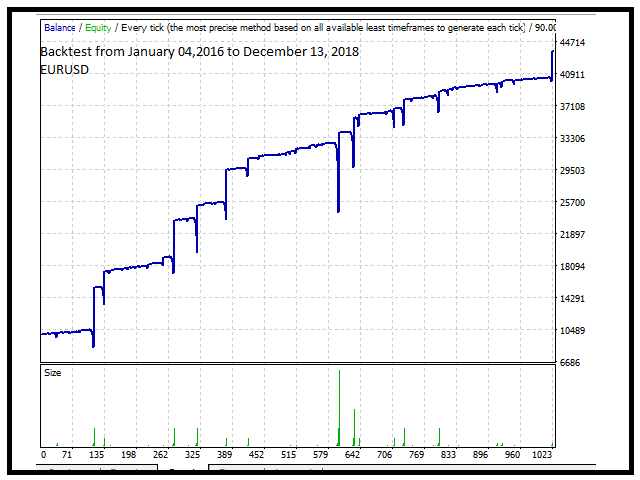 For more questions and suggestions, email me at geniebulltrader@gmail.com or private message me here at MQL5. This is a fantastic EA for the price. You will need to experiment for your best setting. I tested 100 Pips SL and changed it from Crossover to Trend Following strategy and am getting really good tests. You will find better settings than this. Genesis a great programmer and will indeed support you when you message him. Reverse Logic - if Reverse Logic is set to true, opening and closing of position will be reverse in order type.